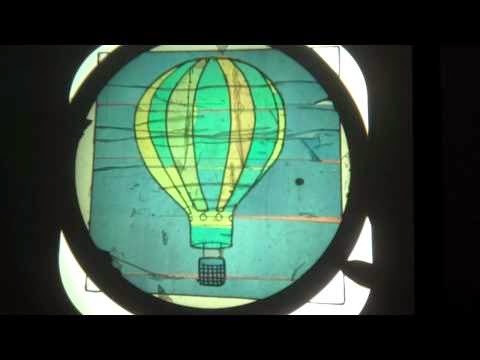 A simple polarization filter and some cellophane tape makes this sketch of a hot air balloon turn all different colors at all different times. See the weirdness of polarization and color. Polarized light is a simple affair. Take light that's coming in, and filter it, reflect it, or scatter it so that every wave of light is vibrating in the same plane. It's all "waving" up and down, or side to side. If light is waving one direction - vertically - and over it is placed a polarization filter that filters the light horizontally, the light is completely blocked. Twist the filter around so it filters light vertically as well, and all the light gets through. But light doesn't have to be polarized in all the same direction. Some materials, among them karo syrup and certain kinds of tape, can polarize different colors of light to different angles. Red light waves might all vibrate vertically, while blue light vibrates slightly to the side, and violet light vibrates horizontally. Now place a filter over this new set of polarized colors. As you turn the filter, it will block out certain colors, and let other colors through. In this video, people have taped over different sections of a picture (set on glass) of a hot air balloon. The tape is put up at many different angles, so each section of tape polarizes colors to different angles. As the filter is twisted, it filters out different colors, and lets through other colors, so different sections of the balloon seem to randomly change color.